Video tutorial for Drop 6 (RuneMaster v2.0) coming soon. Any plan for an update with the new runes with RTM? Could you add the possibility to make rune plans on 'blank' 5 rune slot items ? 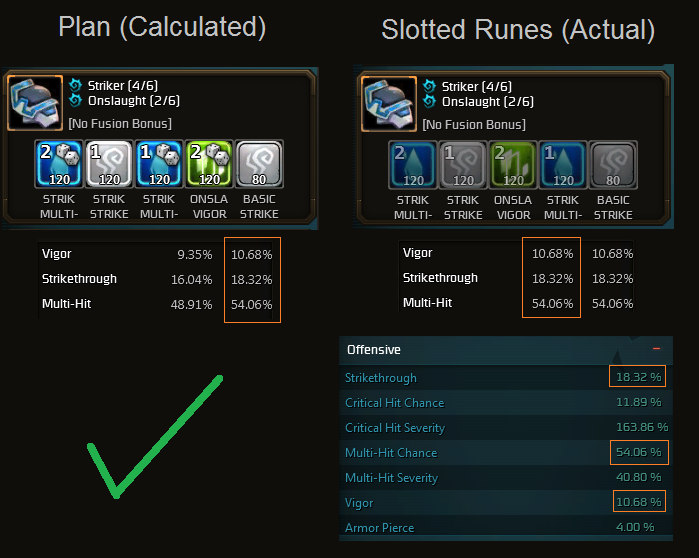 (I'd like to compare rune plans without the impact of my current items) or an option to discard item stats in the total stats displayed? One of my goal for that is to make plans for my pvp gear, but I don't have all yellow items yet (and that's just an example). Runing any of the three new runesets from HM(Foil, Ruthless, Curator) results in error and stats no longer showing. Please make it so that when planning runes, it does not limit you by what is already in your equip but rather by the other planned runes in the same piece. You can put some kind of warning like "you already have that rune in your current equip" but don't stop the user from planning it again anyway. Oh and just check everything in the rune planning part because it can do some really weird stuff like block the planning of a rune that is neither already in the equip nor already planned. Example: Insert Superb Devastation Rune: Critical Hit. Stat review shows increase in Critical Hit. However it does not include the Rune Set Bonus of 2 Power +0.21% Strikethrough. Thanks, I'll work on this for 2.1.5. Armor bonus from Alleviation and Defiance rune sets is not included. Hp bonus form Alleviation rune set is not included. I'm getting this after the patch today. No idea if it's a Carbine thing or a RuneMaster thing. RuneMaster thing... sorta. Fixed in the latest update. Thank you! While clicking on Rune All, I'm met with this error. I've tried to work around it, but have seen no success. Go into the RuneMaster settings (button in top left) and remove the rune plan that doesn't belong. It will usually be one that isn't an equipped item. I'll be fixing it in the near future, but that's the work around for now. Also fixed in the latest update. Thanks for the report! Hi, great addon but your stat calculation is inorrect? we did the research yersterday and its sadly wrong. Our thoughts were it could be something with the stat / % calculation. Thanks for being so descriptive </sarcasm>. Did you update to the latest version? What stats are wrong? What do you have planned (sets, stats, etc)? I cannot find any incorrect calculations. I could really use some input on what is wrong. I just planned and runed a piece of gear, and the pre-runing estimates matched the actual stats after runing.